A native of Ohio, George Crook graduated from West Point in 1852 and was serving in the army fighting indians in the west when the Civil War began. In September 1861 Crook was made colonel of the 36th Ohio Infantry and served in western Virginia. He was wounded at Lewisburg, Va., in May 1862, and in September of that year he was promoted to brigadier general. 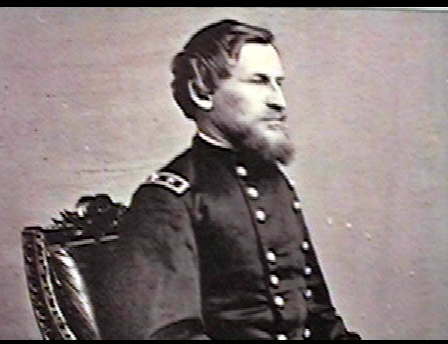 General Crook commanded a brigade of Ohioans who led the attack at South Mountain and fought for Burnside Bridge at Sharpsburg. Crook then went west, leading his men in the Tullahoma campaign and commanding a division of cavalry at Chickamauga, Tenn. In charge of an infantry division in the Battle of Cloyd's Mountain on May 9, 1864, Crook was in the middle of the front line as it charged. The Yankees were successful and burned the 400 foot New River Bridge, once again disrupting service for the Virginia & Tennessee Railroad. In the Shenandoah campaign, Crook was vehemently opposed to General David Hunter's burning of the Virginia Military Institute campus, but it was torched anyway. In August 1864 Crook succeeded Hunter as commander of the Department of Western Virginia and led the VIII corps in General Philip Sheridan's Army of the Shenandoah. Crook called his mountain men "little more than a large raiding party," but he and his corps fought with success at Winchester, where they faced a "continuous wail of musketry." They fought gallantly at Fisher's Hill and Cedar Creek. After his fourth citation for gallantry Crook was promoted to major general of volunteers in October 1864. In February 1865 Crook was captured in a daring raid by McNeill's Rangers and spent 28 days in Libby Prison before being exchanged. Assigned to the Army of the Potomac, Crook led a cavalry division, fought at Five Forks, and pursued Confederates to Appomattox. After the war he fought indians in the west. Crook died-still in the army-at age 61.